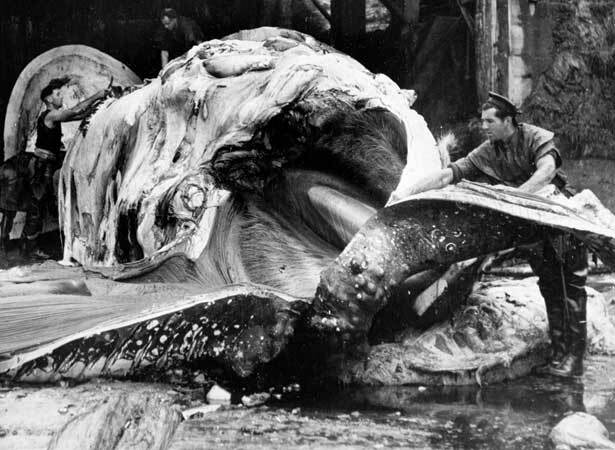 More than 170 years of New Zealand whaling history ended when J.A. Perano and Company caught its last whale off the coast near Kaikōura. Whaling ended because of a lack of whales rather than because of public distaste for the practice. Not until 1978 would all marine mammals receive legal protection in New Zealand waters. Dunedin-born Joe Perano had started whaling out of Tory Channel in the Marlborough Sounds in 1911, beginning a 53-year family business. He was credited with bringing many modern innovations to the New Zealand whaling industry: he constructed this country’s first power-driven whale chaser, was the first operator to use explosive harpoons, introduced the electric harpoon, and in 1936 equipped his whale chasers, mother ship and shore stations with radio telephones. Joe Perano died in 1951, aged 74. In 1964 his sons, Gilbert and Joseph, were running the business. The whale they killed on 21 December was the last harpooned in New Zealand waters from a New Zealand-owned ship. Wellington Head, a steep headland on Arapawa Island, was renamed Perano Head in 1969.